This massive palace (now a museum) in Lhasa, Tibet was once the winter religious and political seat of Tibet under the leadership of the Dalai Lama. The Potala Palace's interior is today filled with the same sounds (chanting) and scents (incense and yak-butter burning lamps) that visitors encountered centuries ago. 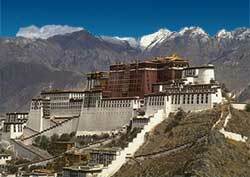 The 13-story Potala Palace has no elevator. There are three sets of stairways, which are steep and ladder type. Only the Dalai Lama was allowed to use the middle one.